Suddenly my nine month old doesn’t want to nap in the mornings. Is one nap enough for her? She sleeps for about two hours in the afternoon. She sleep reasonable well at night, waking for a cuddle/sometimes breastfeed every few nights. Babies often go through stages where their day sleeps start to fall apart. As a parent it is easy to then become confused as to whether your baby really needs that sleep or not. Often the backtrack on sleep happens as the same time as developmental milestones, rolling over, up on hands and knees, crawling around, sitting & standing up. This can be due to a combination of being just ‘too tired’ to fall asleep and thus needing more wind down time as their brain is so busy and has been stimulated more than usual, as well as physically being tired from all the new ‘practice’. 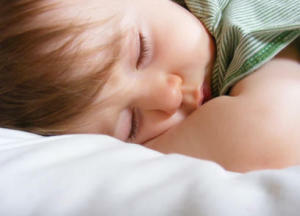 As tired children have more difficulty sleeping than not so tired. Not quite what you would logically think as we tend to think that ‘the tireder they are the better they will sleep’ this is NOT TRUE with babies and children. I am assuming that this is more than likely the reason of your babies not so good sleep at the moment rather than her naturally dropping a sleep. Certainly at the age of nine months, cutting out the morning sleep is way too early at this point in your babies development. Your baby will need the morning sleep which should be about two sleep cycles, so about 1 hr + in length plus the lunch time sleep which should be a good 2 hours +. So persist with putting your baby down for her morning nap and leave her there for her usual sleep time, so that if she doesn’t sleep she is still relaxing, winding down and resting. It is around this 9 month age that the afternoon sleep drops off totally. However usually they are unable to cope with the long afternoon without lots of crying etc. So once you see that your little one is tired in the afternoon then start your night time routine and get her down to sleep for the night ASAP. Twelve hours of sleep is still recommended during the night at this age as well. So this sounds as though it is on track. Just be persistent with the morning sleep.